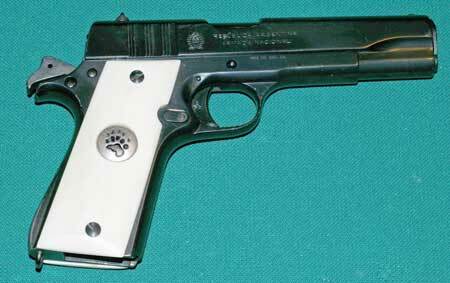 The Ballester-Molina firm made South American copies of the Colt 1911 with a few differences, including grips that are not mounted the same way as the Colt. These grips mount with two screws each that go directly into tapped holes in the frame, rather than the US government standard specs for a 0.250-inch diameter mounting stud and a 0.150-inch threaded screw that fits into the post. In other words, you cannot use these grips on a 1911 clone, and you can't put Colt 1911 grips on a Ballester-Molina. But you can get the original vertical-corrugation style "checkering" or a smooth version, which looks great with a pearl or metallic effect (copper or gold pearl, or aztec gold, looks amazing on the gun, especially with a silver medallion).